The antibody inhibits the activation of p34cdc2 kinase by cyclins. A study published in the Biotechniques journal suggests that ab18 cross-reacts with Cep152 protein. This should not be a problem for simple western blot experiments because of the difference in molecular weight (MW) between Cdk1 and Cep152. (Cdk1 has a predicted MW of 34-kDa. Isoforms 1-4 of Cep152 have predicted MW of 147, 158, 189 and 196-kDa respectively.) However, this could potentially cause misleading results in Immunofluorescence and pull down experiments. Abcam welcomes customer feedback. Recombinant fragment corresponding to Xenopus laevis CDK1 aa 50 to the C-terminus (C terminal). The epitope is thought to be residues 220-227 of mouse cdc2, LGTPNNEV. WB: HeLa, Jurkat, MCF7, A431, RAW 264.7 and NIH/3T3 whole cell lysate. IHC-P: Human skin. Human lung cancer tissue. FC: MCF7 cells. Our Abpromise guarantee covers the use of ab18 in the following tested applications. WB Use at an assay dependent concentration. Predicted molecular weight: 34 kDa. This blot was produced using a 4-12% Bis-tris gel under the MOPS buffer system. The gel was run at 200V for 50 minutes before being transferred onto a Nitrocellulose membrane at 30V for 70 minutes. The membrane was then blocked for an hour using 2% Bovine Serum Albumin before being incubated with ab18 overnight at 4°C. 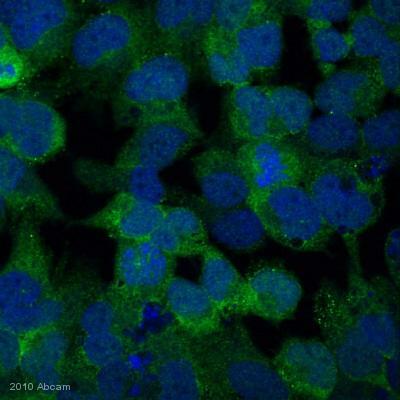 Antibody binding was detected using an anti-mouse antibody conjugated to HRP, and visualised using ECL development solution. Ab18 staining human skin. Staining is localized to the cytoplasm and nucleus. Overlay histogram showing MCF7 cells stained with ab18 (red line). The cells were fixed with 4% paraformaldehyde (10 min) and then permeabilized with 0.1% PBS-Tween for 20 min. The cells were then incubated in 1x PBS / 10% normal goat serum / 0.3M glycine to block non-specific protein-protein interactions followed by the antibody (ab18, 0.5µg/1x106 cells) for 30 min at 22ºC. The secondary antibody used was DyLight® 488 goat anti-mouse IgG (H+L) (ab96879) at 1/500 dilution for 30 min at 22ºC. Isotype control antibody (black line) was mouse IgG2a [ICIGG2A] (ab91361, 1µg/1x106 cells) used under the same conditions. Acquisition of >5,000 events was performed. This antibody gave a positive signal in MCF7 cells fixed with 80% methanol (5 min)/permeabilized with 0.1% PBS-Tween for 20 min used under the same conditions. Immunohistochemistry (Formalin/PFA-fixed paraffin-embedded sections) - Anti-CDK1 antibody [A17] (ab18)Image from Zhang C et al., PLoS One. 2011;6(8):e23849. Epub 2011 Aug 24. Fig 3.; doi:10.1371/journal.pone.0023849; August 24, 2011, PLoS ONE 6(8): e23849. Immunohistochemical analysis of Human lung cancer tissue, staining CDK1 with ab18 at 1/100 dilution. Publishing research using ab18? Please let us know so that we can cite the reference in this datasheet. Schaden genommen, werde ihn aber erstmal testen. Der Antikörper sollte dies eigentlich unbeschadet überstanden haben. Wir versenden unsere Antikörper so z.B. auch nach Australien oder Thailand, und da kann es schon einmal zu Transitzeiten von einer Woche kommen, und bisher haben wir noch keine erhöhten Beschwerderaten für die so versandten Produkte. Die meisten Antikörper sind für längere Zeit bei Raumtemperatur stabil. Versuche bei Abcam mit Antikörpern, die über einen längeren Zeitraum bei Raumtemperatur gelagert wurden, haben gezeigt, dass die Aktivität erst nach zwei Monaten nachlässt. Dennoch verschicken wir Antikörper als Vorsichtsmaßnahme mit Kühlpaketen, die die Umgebungstemperatur für 48 Stunden bei circa 4°C halten. Dieses verbessert auch die Haltbarkeit der Antikörper und verringert das rapide Auf- und Abkühlen der Antikörper. Falls es denoch zu Problemen kommen sollte, melden Sie sich bitte uns. bzw. Goat Anti-Guinea-Pig-Alexa568 oder -488. Zellkernfärbung mit DAPI. - Paraffinschnitte, Vorrbehandlung und Ag-Retrieval wie bei 2. - Procedure wie bei 3.
so wie es in dem Abreview-Protokoll für HeLa-Zellen abgebildet ist. Bilder von CdK1-positiven Zellen und Geweben ja zustande kommen. Ich freue mich, wenn Sie mir den entscheidenden Hinweis geben können. Vielen Dank für IhreAnfrage und all dieInformationen. Es tut mir leid zu hören, dass dieses Röhrchen vonab18 keine guten Ergebnisse liefert. Ich stimme Ihnen zu, dass kein spezifisches Signal erkannt werden kann in all den von Ihnen durchgeführten Experimenten. Deshalb denke ich, dass Sie ein schlechtes Röhrchen erhalten haben. Der hohe Hintergrund ist sicherlich auf den Sekundären Antikörper zurückzuführen, da auch die Negativkontrolle ohne primären Antikörper diesen Hintergrund anzeigt. Leider muss meisten auch der Permeabilisierungsschritt optimiert werden. So ist z.B. Saponin reversibel und sollte deshalb in allen Puffern verwendet werden während des Experiments. Ich weiß, dass Sie viel Zeit für diese Experimente verwendet haben und möchte Ihnen daher ein neues Röhrchen oder einen Gutschein als Ersatz anbieten (vorausgesetzt, das Produkt wurde in den letztensechs Monatengekauft). Dafür benötige ich jedoch ihre ursprüngliche Bestellnummer und die Lotnummeroder einen Kontakt in Ihrer Einkaufsabteilung und das Datum der Bestellung. Würden Sie mir bitte zusammen mit diesen Informationen mitteilen, welche Alternative Sie bevorzugen? Thank you for your email. I have just been informed by my colleague that the blocking peptide is out of stock. Therefore they will not be able to publish the datasheet hence we are unable to fulfil your request this time. I have done my best to publish this product without delays however due to non availability of the product this happens to be not possible. I sincerely apologize for the inconvenience this may have caused. I hope this information is nevertheless helpful. Should you have any other question pleasedo not hesitate to contact me. Thank you for your email. I have sent request to datasheet team for publishing the datasheet of blocking peptide. They will be able to publish this on Monday next week. I will then send you the catalogue number for ordering. Many thanks for having patience! Thank you for contacting us. Isotype controls are the primary antibodies that do not have specificity for any target. These can be used as negative control and are helpful in determining the background staining due to secondary antibodies. By comparing the result of actual primary antibody and isotyope control ab you may determine the target localization easily. No primary control also helps determining the background staining due to secondary antibodies. I hope this information is helpful to you. Please do not hesitate to contact us if you need any more advice or information. Thank you for contacting us. We can provide blocking peptide for ab47329 as a special request. Could you please confirm if you are interested in buying this? We unfortunately will not be able to supply the blocking peptide for ab18. I suggest trying alternatives as isotype control or no primary control in experiment. We have isotype control products with catalogue number ab18414, ab91361 etc. https://www.abcam.com/Mouse-IgG2a-kappa-MOPC-173-low-endotoxin-isotype-control-ab18449.html https://www.abcam.com/Mouse-IgG2a-ICIGG2A-Isotype-Control-ab91361.html I hope this information is helpful to you. Please do not hesitate to contact us if you need any more advice or information. We do not have any report that this or any other Cdc's are androgen regulated. We are sorry that we do not have any further information and suggest you refer to the latest literature in the field. This antibody has not yet been tested for cross-reactivity with rabbit.